The Low Down: Mia didn’t really care about Prom until the hottest football player asked her to go. And now that she’s bought the perfect dress and is really excited about being there with Rob, she starts freaking out because her date starts paying a lot of attention to Samantha, the Queen Bee/cheerleader. How humiliated she will be if he dumps her to go with someone else! She has to do something, but what? Mia’s best friend and hypochondriac, Candice, happens to know someone who might be able to help. A skeptic at first, Mia doesn’t see how some crazy lady and a few ingredients will ensure that Rob forgets about Samantha. Then at the Senior Assembly, Mia throws caution and uncertainty to the wind and goes for it. But when the New Boy, Chase, tells her that her spell (how’d he know she did a spell anyway?) she cast wasn’t about love but about turning everyone present into zombies, they have to act fast to reverse the spell. Oh, and Chase is a zombie hunter. The good news? Because she performed the incantation, Mia won’t be infected. The bad news? The zombies will make her their queen…and eat her. ‘Cause, apparently, she smells like chicken. What What? : It’s a fun story that you’ll just sail through reading. Don’t expect a lot of depth or challenges here – it’s silly with a dash of romance thrown in. Not many surprises. The grammarian in me has to bring up two instances where the text said “…she thought he was going to lower her down…” and “…lowering her slowly down…” The word “lower” already means to go in a downwardly direction. It is redundant to have the word “down” in there. Two things my mama taught me: you don’t raise up and you don’t lower down. The Bottom Line: A diverting little book that will serve as a palate cleanser to something with a bit more meat on its bones. 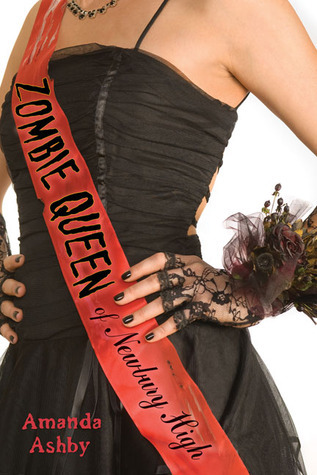 Zombie Queen of Newbury High by Amanda Ashby was published March 5, 2009 by Speak. Ink and Page picked this book up from the library, so no one had a choice about whether it was reviewed.